McKesson Folding Bedside Commode from HealthyKin.com easily opens and folds flat for convenient storage and transportation. It features a durable plastic snap-on seat and lid and is easily assembled. The grey powder-coated steel welded construction increases strength and durability. Plastic arms provide added comfort. 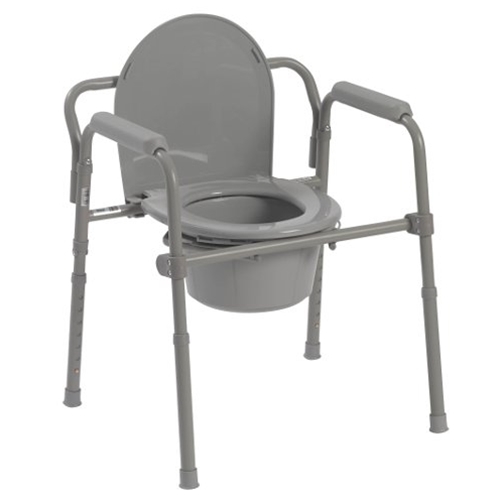 This folding commode comes complete with 7.5 quart commode bucket with carry handle, cover and splash shield. Seat height: adjustable from 16.6" to 22.5"
Best bedside commode for the money. The legs adjust in height allowing us to tip our daughter backwards just a bit for comfort. This is a good product. This product does exactly what you want it for. It makes life so much easier at a time when you need easier. Thank you for being there for people when these things are needed. Easy to set up and fold up! Very compact for easy storage! Not wide enough for larger patience. Could use a few more inches. But, made of strong, good materials. Great product. Makes the transfer from wheelchair or bed far easier than to a standard toilet. Worth every penny! Great product, just what I needed, thank you. Arrived on time and at a great price. Very good product, easy to put together. Delivered in a very short time.